George II (George Augustus; German: Georg II. August; 30 October / 9 November 1683O.S./N.S. – 25 October 1760) was King of Great Britain and Ireland, Duke of Brunswick-Lüneburg (Hanover) and Prince-elector of the Holy Roman Empire from 11 June 1727 (O.S.) until his death. George was the last British monarch born outside Great Britain: he was born and brought up in northern Germany. 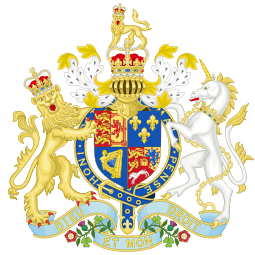 His grandmother, Sophia of Hanover, became second in line to the British throne after about fifty Catholics higher in line were excluded by the Act of Settlement 1701 and the Acts of Union 1707, which restricted the succession to Protestants. After the deaths of Sophia and Anne, Queen of Great Britain, in 1714, his father George I, Elector of Hanover, inherited the British throne. 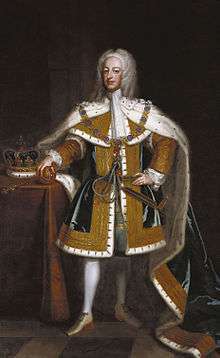 In the first years of his father's reign as king, George was associated with opposition politicians, until they rejoined the governing party in 1720. 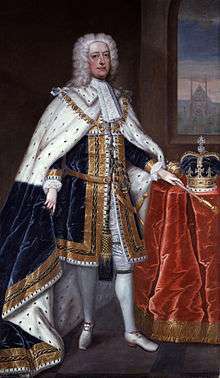 As king from 1727, George exercised little control over British domestic policy, which was largely controlled by the Parliament of Great Britain. As elector, he spent twelve summers in Hanover, where he had more direct control over government policy. He had a difficult relationship with his eldest son, Frederick, who supported the parliamentary opposition. During the War of the Austrian Succession, George participated at the Battle of Dettingen in 1743, and thus became the last British monarch to lead an army in battle. 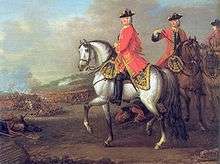 In 1745, supporters of the Catholic claimant to the British throne, James Francis Edward Stuart ("The Old Pretender"), led by James's son Charles Edward Stuart ("The Young Pretender" or "Bonnie Prince Charlie"), attempted and failed to depose George in the last of the Jacobite rebellions. Frederick died unexpectedly in 1751, nine years before his father, and so George II was ultimately succeeded by his grandson, George III. For two centuries after George II's death, history tended to view him with disdain, concentrating on his mistresses, short temper and boorishness. Since then, most scholars have reassessed his legacy and conclude that he held and exercised influence in foreign policy and military appointments. George was born in the city of Hanover in Germany, and was the son of George Louis, Hereditary Prince of Brunswick-Lüneburg (later King George I of Great Britain), and his wife, Sophia Dorothea of Celle. Both of George's parents committed adultery, and in 1694 their marriage was dissolved on the pretext that Sophia had abandoned her husband. She was confined to Ahlden House and denied access to her two children, George and his sister Sophia Dorothea of Hanover, who probably never saw their mother again. George spoke only French, the language of diplomacy and the court, until the age of four, after which he was taught German by one of his tutors, Johann Hilmar Holstein. In addition to French and German, he was also schooled in English and Italian, and studied genealogy, military history and battle tactics with particular diligence. 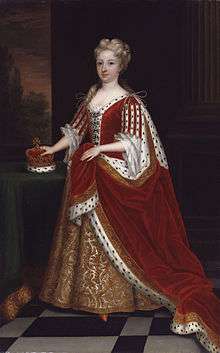 George's second cousin once removed, Queen Anne, ascended the thrones of England, Scotland and Ireland in 1702. 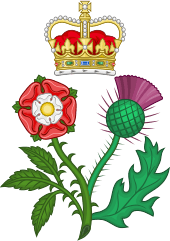 She had no surviving children, and by the Act of Settlement 1701 the English Parliament designated Anne's closest Protestant blood relations, George's grandmother Sophia and her descendants, as Anne's heirs in England and Ireland. Consequently, after his grandmother and father, George was third in line to succeed Anne in two of her three realms. 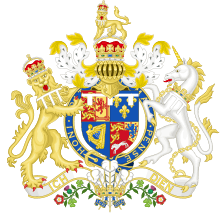 He was naturalized as an English subject in 1705 by the Sophia Naturalization Act, and in 1706 he was made a Knight of the Garter and created Duke and Marquess of Cambridge, Earl of Milford Haven, Viscount Northallerton and Baron Tewkesbury in the Peerage of England. 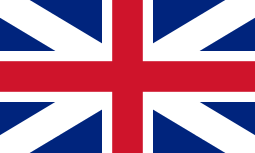 England and Scotland united in 1707 to form the Kingdom of Great Britain, and jointly accepted the succession as laid down by the English Act of Settlement. By 1714, Queen Anne's health had declined, and British Whigs, politicians who supported the Hanoverian succession, thought it prudent for one of the Hanoverians to live in England, to safeguard the Protestant succession on Anne's death. As George was a peer of the realm (as Duke of Cambridge), it was suggested that he be summoned to Parliament to sit in the House of Lords. Both Anne and George's father refused to support the plan, although George, Caroline and Sophia were all in favour. George did not go. Within the year, both Sophia and Anne were dead, and George's father was king. George and his father sailed for England from The Hague on 16/27 September 1714 and arrived at Greenwich two days later. The following day, they formally entered London in a ceremonial procession. George was given the title of Prince of Wales. Caroline followed her husband to Britain in October with their daughters, while Frederick remained in Hanover to be brought up by private tutors. London was like nothing George had seen before: it was 50 times larger than Hanover,A and the crowd was estimated at up to one and a half million spectators. George courted popularity with voluble expressions of praise for the English, and claimed that he had no drop of blood that was not English. In July 1716, the king returned to Hanover for six months, and George was given limited powers, as "Guardian and Lieutenant of the Realm", to govern in his father's absence. He made a royal progress through Chichester, Havant, Portsmouth and Guildford in southern England. Spectators were allowed to see him dine in public at Hampton Court Palace. An attempt on his life at Drury Lane Theatre, in which one person was shot dead before the assailant was brought under control, boosted his high public profile. George and Caroline missed their children, and were desperate to see them. On one occasion they secretly visited the palace without the approval of the king; Caroline fainted and George "cried like a child". The king partially relented and permitted them to visit once a week, though he later allowed Caroline unconditional access. The following February, George William died, with his father by his side. 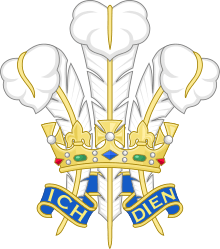 Banned from the palace and shunned by his own father, for the next several years the Prince of Wales was identified with opposition to George I's policies, which included measures designed to increase religious freedom in Great Britain and expand Hanover's German territories at the expense of Sweden. His new London residence, Leicester House, became a frequent meeting place for his father's political opponents, including Sir Robert Walpole and Viscount Townshend, who had left the government in 1717. 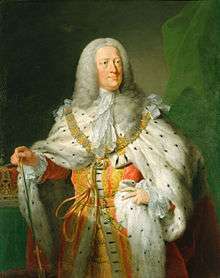 The king visited Hanover again from May to November 1719. Instead of appointing George to the guardianship, he established a regency council. In 1720, Walpole encouraged the king and his son to reconcile, for the sake of public unity, which they did half-heartedly. Walpole and Townshend returned to political office, and rejoined the ministry. George was soon disillusioned with the terms of the reconciliation; his three daughters who were in the care of the king were not returned and he was still barred from becoming regent during the king's absences. He came to believe that Walpole had tricked him into the rapprochement as part of a scheme to regain power. Over the next few years, he and Caroline lived quietly, avoiding overt political activity. They had three more children: William, Mary and Louisa, who were brought up at Leicester House and Richmond Lodge, George's summer residence. Against Walpole's wishes, but to George's delight, Britain reopened hostilities with Spain in 1739. Britain's conflict with Spain, the War of Jenkins' Ear, became part of the War of the Austrian Succession when a major European dispute broke out upon the death of the Holy Roman Emperor Charles VI in 1740. At issue was the right of Charles's daughter, Maria Theresa, to succeed to his Austrian dominions. 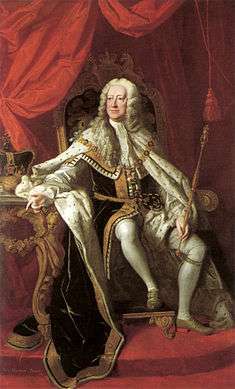 George spent the summers of 1740 and 1741 in Hanover, where he was more able to intervene directly in European diplomatic affairs in his capacity as elector. Prince Frederick campaigned actively for the opposition in the British general election, 1741, and Walpole was unable to secure a stable majority. Walpole attempted to buy off the prince with the promise of an increased allowance and offered to pay off his debts, but Frederick refused. With his support eroded, Walpole retired in 1742 after over 20 years in office. He was replaced by Spencer Compton, Lord Wilmington, whom George had originally considered for the premiership in 1727. Lord Wilmington, however, was a figurehead; actual power was held by others, such as Lord Carteret, George's favourite minister after Walpole. When Wilmington died in 1743, Henry Pelham took his place at the head of the government. 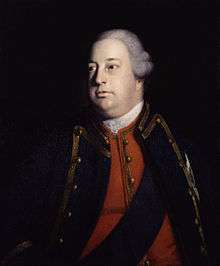 George's son the Duke of Cumberland commanded the king's troops in northern Germany. In 1757, Hanover was invaded and George gave Cumberland full powers to conclude a separate peace. By September, however, he was furious at Cumberland's negotiated settlement, which he felt greatly favoured the French. George said his son had "ruined me and disgraced himself". Cumberland, by his own choice, resigned his military offices, and George revoked the peace deal on the grounds that the French had infringed it by disarming Hessian troops after the ceasefire. 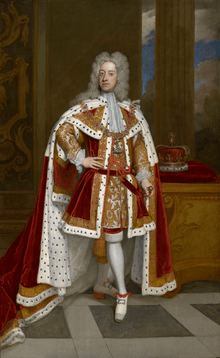 By October 1760, George II was blind in one eye, and hard of hearing. On the morning of 25 October, he rose as usual at 6:00 am, drank a cup of hot chocolate, and went to his close stool, alone. After a few minutes, his valet heard a loud crash. He entered the room to find the king on the floor. The king was lifted into his bed, and Princess Amelia was sent for, but before she reached him, he was dead. At the age of nearly 77, he had lived longer than any of his English or British predecessors. A post-mortem revealed that the right ventricle of the king's heart had ruptured as the result of an incipient aortic aneurysm. George II was succeeded by his grandson George III, and was buried on 11 November in Westminster Abbey. He left instructions for the sides of his and his wife's coffins to be removed so that their remains could mingle. ^O.S./N.S. Over the course of George's life, two calendars were used: the Old Style Julian calendar and the New Style Gregorian calendar. Hanover switched from the Julian to the Gregorian calendar on 19 February (O.S.) / 1 March (N.S.) 1700. Great Britain switched on 3/14 September 1752. In this article, individual dates before September 1752 are indicated as either O.S. or N.S. or both. All dates after September 1752 are N.S. only. All years are assumed to start from 1 January and not 25 March, which was the English New Year. ↑ e.g. The London Gazette: no. 5264. p. 1. 28 September 1714. Hervey, John Hervey Baron. Some materials towards memoirs of the reign of King George II (Eyre & Spottiswoode, 1931). Smith, Hannah. "The Court in England, 1714–1760: A Declining Political Institution?." History 90.297 (2005): 23-41.